I’m a firm believer that everything tastes better in the backcountry after a long day on the trail. However, it takes some careful preplanning to ensure your three square meals are easy to prepare and even easier to clean up. 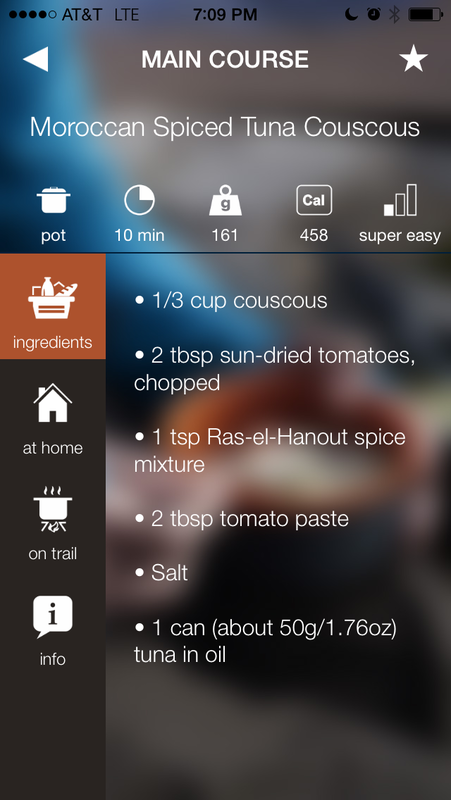 The Trail Chef iPhone App gives you an easy and organized way to create an appetizing backpacking menu. After downloading the app to your smartphone, you have access to more than 50 recipes that are great for backpacking and the option to add your own favorites. You can prearrange your backpacking meals in categories, get their nutritional info and plan daily menus according to your caloric needs and preferences. However, after getting more familiar with the app, I realized the bulk of its use occurs before you’re on the trail—and it proved extremely helpful in planning out what I would need to pack for each meal and, more importantly, what prep could be done at home to speed up meal time on the trail. When you’ve been playing in the woods all day, the sooner you can eat, the better. I didn’t use the app while I was in the backcountry, but it does have off line capabilities if you do end up taking your phone with you. Just make sure you write down or memorize the “on trail” steps for the recipe if you decide not to bring your phone camping. 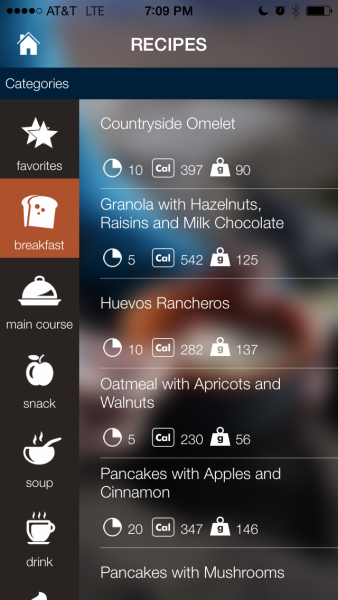 First, you’ll choose a recipe from either meal categories (breakfast, main course, etc.) or, more specifically, by vegetarian, one-pot, lightweight, dessert or others options. Once you’ve chosen the category, you can scroll through recipe options that include information like cook time, calories and weight. Once you make your choice, the app will let you know what you’ll need to cook it in (pot, pan, etc. ), the ingredients list (hugely helpful while at the grocery store! ), what can be done at home, what to do on the trail, as well as detailed nutritional information. Most of these recipes are for one person, so if you’re cooking for two—or just eating double portions—make sure to account for that when portioning the ingredients. 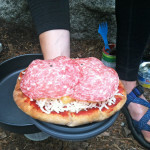 I often find I repeat so many of the same backpacking meals that are, admittedly, unexciting. 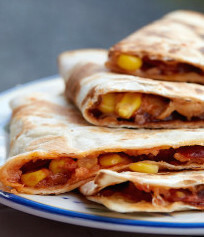 I’m usually so hungry I don’t mind, but the Trail Chef recipes are full of flavor and combinations I never would have thought to take on the trail. One super easy (that’s how it’s ranked!) option I love is the Moroccan Spiced Tuna Couscous. You only need one pot, so clean up is a breeze, and it only takes about 10 minutes to make. At home, combine couscous, tomatoes and a special spice mixture in one ziplock; tomato paste, salt and tuna stay separate (tip: use tuna packets rather than cans). 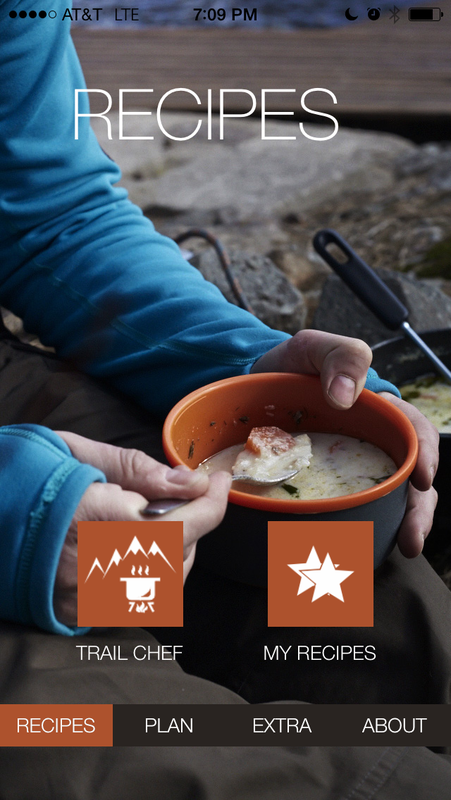 On the trail, boil water to cook the grain, add your other ingredients (already measured out), mix and enjoy. There are almost 20 grams of protein in this dish and it’s packed full of flavor. The next time you’re sitting through a boring meeting, dreaming of your weekend excursion, browse through the many different options and flag your favorites with the star icon in the top right corner. From the homepage, you can easily access them. There’s also the option to make a meal plan for a multi-day trip, which helps keep food organized, so you’re not left with too little on your trip or waste energy packing in too much. You select the number of days, then choose recipes for breakfast, lunch, dinner and snacks for each day. The app will total up the daily calories and weight of the food/ingredients for each day, making it really easy to track and plan. 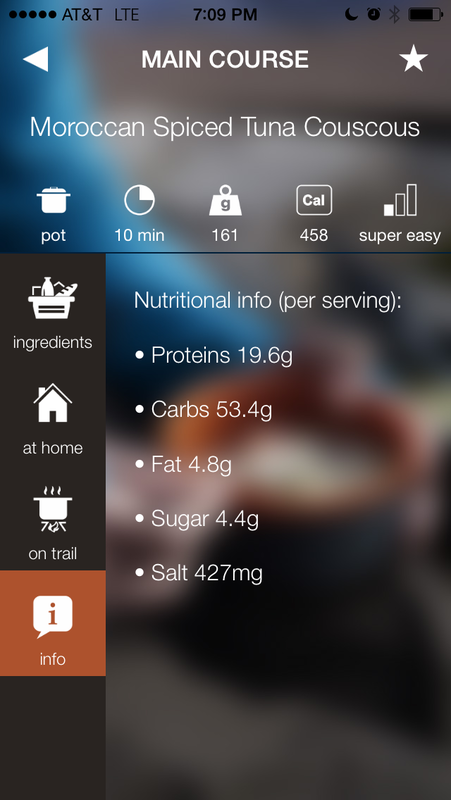 The app is very well thought out, and each recipe is trail tested by the creator Tanya Krezevska, the woman behind a well known site called Trail Recipes. 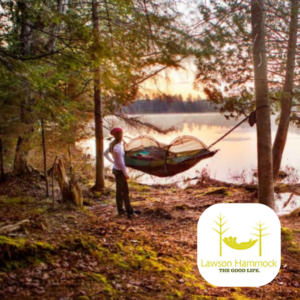 She has also authored two E-books, Trail Chef: 50 Lightweight Backpacking Meal Recipes and Trail Chef: 100 Simple and Delicious Recipes for Hiking, Camping and Backpacking. The books go into much more detail than the app does and are great reads, especially if you’re interested in nutrition. Tanya has done a great job, both in the app and the books, with meals made with natural, real foods and ingredients. No harmful preservatives, no fillers or artificial colors, just natural good eats. The app is easy to use, full of great information and delicious recipes. The books are loaded with more good recipes, but the app is much more functional in terms of prep and planning.